Meteors explode from the inside out as they plunge through Earth's atmosphere, new research shows. Using computer simulations, the authors of a new research paper show that gases in Earth's atmosphere may infiltrate the interior of porous meteors as they hurtle toward the planet, creating pockets of high-pressure air inside the rocky space debris. These pockets can then cause the space rocks to explode, breaking into smaller pieces. This could be a benefit for life-forms on Earth, because it means fewer large meteors survive long enough to impact Earth's surface, the researchers said. Melosh presented the findings Dec. 11 at the 2017 American Geophysical Union (AGU) Fall Meeting in New Orleans. An estimated 44,000 kilograms (97,000 lbs., or 48.5 tons) of meteoritic matter lands on Earth every day, according to a statement from the AGU. 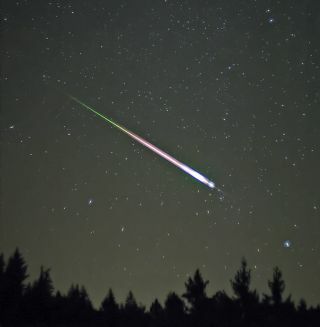 When meteors enter the planet's atmosphere, they heat up, and ultimately disintegrate. (This is either because of something -called ram pressure or friction.). However, the new research highlights a new way in which the atmosphere may break up meteors and protect Earth, the researchers said. In the study, the researchers simulated the meteor that exploded over Chelyabinsk, Russia,on Feb. 15, 2013. The 20-meter (65 feet) rock exploded 18.5 miles (29.7 kilometers) above Earth's surface, damaging buildings and injuring more than 1,000 people. Using the simulations, the researchers aimed to better understand how the Chelyabinsk meteor broke apart and disintegrated as it entered Earth's atmosphere. Unlike earlier models, however, the new simulations factored in the porosity of the meteor, according to the statement. This graphic depicts a comparison of the breakup of a 20-meter (66-foot) diameter meteoroid (similar to the Chelyabinsk asteroid) during the final moments of its flight after entering the atmosphere at an angle of 45° from the horizontal and a speed of 15 kilometers per second (9 miles per second). The time after entry and altitude are shown above each figure and the color depicts the percentage of solid material in each computational cell. The left panel shows an asteroid that is 10 percent porous and the right panel a 30 percent porous asteroid. The more porous asteroid almost entirely disintegrates, while the less porous one breaks up but is not dispersed. The results showed that Earth's atmosphere provides better protection against meteors than scientists previously thought, by creating a dense pocket of air in front of the rockand a vacuum in the meteor's wake. As a result, "the pressurized air bubble ahead of the meteor is strongly attracted to the low-pressure environment developing behind the meteor, causing air particles to rapidly flow through the rock's cracks and holes from the front to the back of the rock," according to the statement. The high-pressure air that is forced into the nooks and crannies of the meteor breaks up the space rock in Earth's upper atmosphere, the researchers said. The findings were published Dec. 11 in the journal Meteoritics & Planetary Science.